Full Building Survey inspections on timber frame buildings are always very interesting as every building is different. 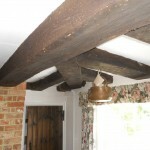 We have recently carried out such a Full Building Survey in Kent on a timber frame building which had unusual Dragon Beam timbers extending out at an angle from the main principal beams; very rarely seen. 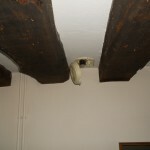 Although large beams, Death Watch Beetle was noted and this will mean treatment with deep penetrating insecticide pastes. We also noted in the cellar that all the wall plates around the floors were not protected by damp proof courses and extremely high damp readings were obtained which will mean that a considerable amount of replacement timber together with protection by damp proof courses will be needed. 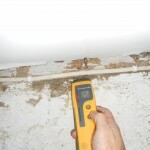 At Brian Gale Surveyors we have the expertise to help to solve the problems that can arise on very old period buildings. It is important to engage a firm with this level of competence.